Firefly carries a Very Low Frequency (VLF) receiver covering from a few ten’s of Hz to to tens of kHz to measure the radio waves emitted by lightning. It was launched November 20 on a Minotaur-1 rocket and NASA have released a video about the satellite. Somewhere on Earth, there’s always a lightning flash. 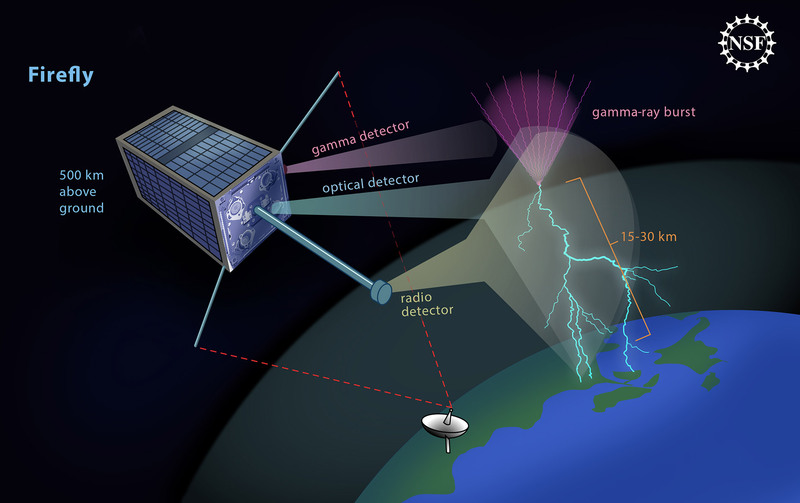 The globe experiences lightning some 50 times a second, yet the details of what initiates this common occurrence and what effects it has on the atmosphere – lightning may be linked to incredibly powerful and energetic bursts called terrestrial gamma ray flashes, or TGFs — remains a mystery. In mid-November, a football-sized mission called Firefly, which is funded by the National Science Foundation, will launch into space to study lightning and these gamma ray flashes from above. The NSF CubeSat program represents a low cost access to space approach to performing high-quality, highly targeted science on a smaller budget than is typical of more comprehensive satellite projects, which have price tags starting at $100 million. The CubeSat Firefly, by focusing its science goals, will carry out its mission in a much smaller package and at a considerably lower cost. The Firefly mission also emphasizes student involvement as part of the ongoing effort to train the next generation of scientists and engineers. Students at Siena College, in Loudonville, N.Y., and the University of Maryland Eastern Shore, in Princess Anne, Md., were involved in all phases of the Firefly mission.